The Simpsons isn't afraid of pulling ideas from their vast library and borrowing a few tropes from seasons past, like in this instance where Marge is overwhelmed by her needy family and finds herself at peace in an unlikely place. While the season finale for their twenty-seventh year might seem unremarkable compared to other outings, 'Orange is the New Yellow' is still a fun 30-minutes of television. For fans of the series' early years, you'll remember episodes such as 'Class Struggle' and 'A Streetcar Named Marge' where our favorite yellow patriarch tried to do something for herself away from the chaotic ramblings of her overbearing husband and children. This week, Marge ends up going to jail for not watching over her son while at the playground. 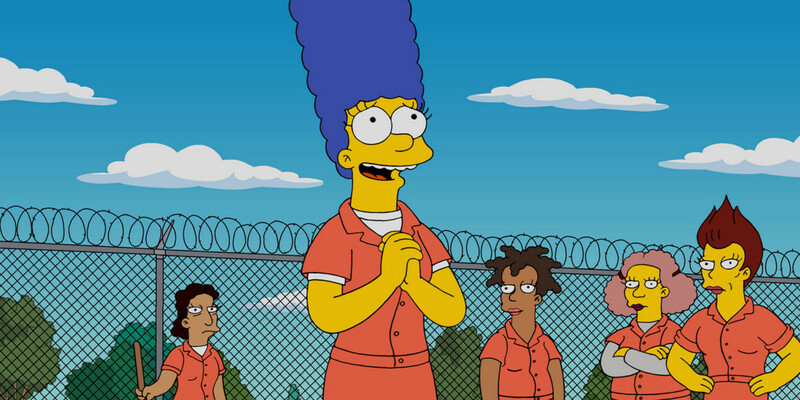 Sentenced for 90 days, Marge finds a sense of purpose and peace while making friends with her fellow inmates. Using her hair, which she refers to as blue thunder, Marge proves she's not to be trifled with. We've always known her to be a tough cookie, but with Homer being the central character in the series for over twenty years now, sometimes we forget just how much she has to put up with. Hardened criminals are nothing compared to raising The Simpson family. 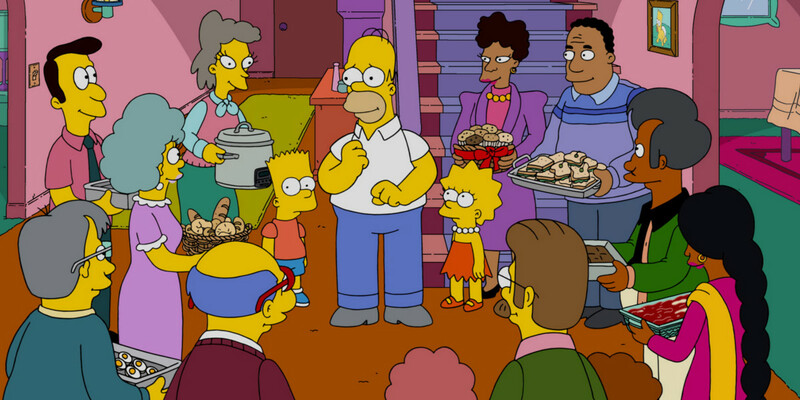 Just like in the season premiere last fall, The Simpsons is all about a family sticking together no matter how stacked the odds are against them. In a world of high divorce rates and families divided, this yellow-skinned band of misfits appear old-fashioned and out of date, but this reviewer would argue that there is still a certain charm to the family and how they live their lives. Homer's fantasy of being the perfect housewife was hilarious, as he quickly ruins it by having a secret drinking problem. Watching Ned Flanders with Marge while Homer passed out on the floor was also enjoyable. Bringing the focus back to Marge, it's always impressive how she makes the best out of the worst situations. While this week's story focused on Marge's survival in prison, there are other classic episodes, like 'Life on the Fast Lane' where she has done the same. Instead of being sent to the big house, Marge is given a bowling ball with the name Homer engraved on it; but instead of throwing it back in her husband's face, she decides to learn how to bowl, which leads to a compromising relationship with her instructor - but like in all family Simpson squabbles, they end up working it out. Again, it's always about family and whenever there is a divide among them, they fall apart. While we await the premiere of season 28 later this year, The Simpsons may not have provided us with much to think about as the summer months approach, but there is something quite remarkable about the longevity it has been blessed with. For some fans, the show hasn't been good since season 9 or 10, but that doesn't mean it's a bad show. There is nothing truly remarkable about this finale, yet it is comforting to know that we can still sit down for 30-minutes and enjoy an adventure with out favorite family week after week. Are you looking forward to more laughs with The Simpson family? The Simpsons will return in the fall of 2016.